Home » Blog » Welcome to our new, one-of-a-kind website! Welcome to our new, one-of-a-kind website! At Carolina Meadows, we’re excited to share with you this marvelous new resource. Just like our community of residents and staff, our new website is inspiring, smart, vibrant, enriching and — when you add it all up — extraordinary. Designed for current residents as well as prospective residents looking for a new home, our website serves as an inside look into our active, thriving continuing care retirement community. The new website allows you to immerse yourself in our world and learn about our unique, resident-driven environment. At Carolina Meadows, our mission is to enable residents to develop their potential for a healthier, more fulfilled senior life, and we offer a comprehensive range of activities, amenities and services designed to help achieve that goal — including countless opportunities for residents to cultivate new friendships and forge meaningful social connections. To make it simple to keep up with the many activities on our campus, this new website provides daily dining menus and event listings that are automatically updated for easy reference. And both staff and residents can easily contribute details about upcoming events to the site. 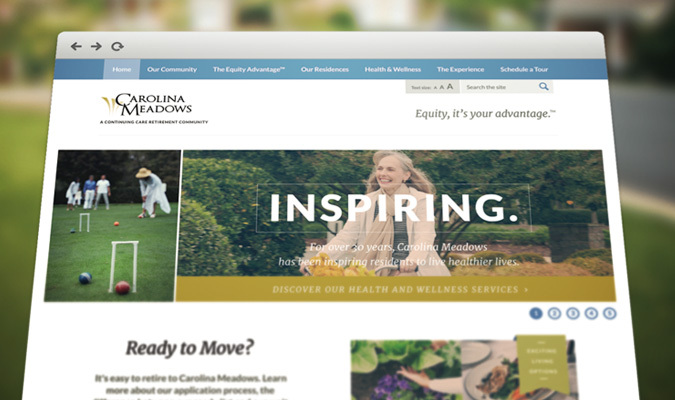 In addition, the site contains a wealth of useful information about our exceptional health and wellness services, outstanding dining facilities, engaging community outreach programs and other benefits of Carolina Meadows living. Want to learn more about the range of housing options and floor plans that are available here at Carolina Meadows? We make it easy to pick the villa or apartment that’s perfect for you on the “Our Residences” page. With this tool, you can search by the number bedrooms and baths, square footage or amenities, such as dens, sunrooms and porches. With so many options, you’ll be sure to find a place that fits your needs and your price. Carolina Meadows also offers a wide variety of customization options. One element that truly sets Carolina Meadows apart from other retirement communities is The Equity Advantage. This program allows our residents to build equity in their homes and receive a return of their initial investment, or more, if they ever need to sell. You’ll find all the details about the program here on our site, as well as an explanation of how our approach differs from the way most other retirement communities work. Our new website is designed to be fully responsive so that it automatically adjusts for any screen size, including tablets, mobile phones and retina devices. It also features a helpful text tool that allows site visitors to quickly adjust font sizes for magnified viewing. After browsing our new website, we think you’ll see why we love Carolina Meadows so much. For over 30 years, Carolina Meadows has been inspiring residents to lead healthier lives. Our location in the Triangle area of North Carolina — which includes Raleigh, Durham, Chapel Hill and Cary — offers easy access to beaches and mountains as well as world-class universities, museums, art galleries and more. With something for everyone, this area truly is a great place to retire. We believe that there is no other retirement destination quite like ours and we now have a website that reflects the special nature of our community. We are excited to show it off to you and hope that you’ll share the site with all your friends!